Dependable and reliable - students, professional bushcraft survival experts and long-distance walkers prefer RouteBuddy Atlas. The best GPS Map Apps keep screen text and buttons to a minimum - so you can concentrate on navigation. So easy with our NEW Precision Plotter - use with one finger, or two for speed plotting. Try it with our free demo maps! Atlas' clear and bright location dial uses a GPS signal - so does not need a phone cell connection to show you where you are. All Map | No Distractions | Clarity - all of which makes Atlas superior when out on a hike or in poor weather conditions. 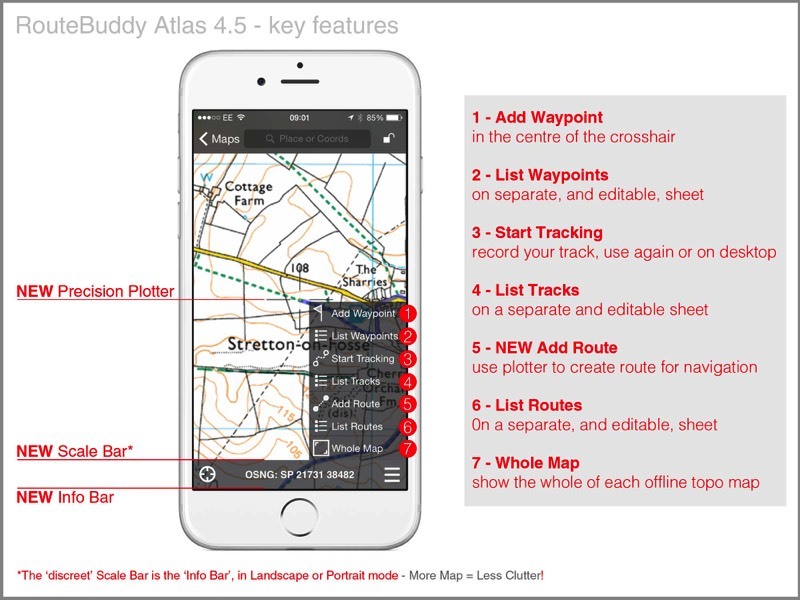 10 easy steps to learn the basics about RouteBuddy Atlas. PLUS! Download a searchable PDF Manual and get more from our Apps & Maps.